Guardians, fiduciaries, and trustees are turning to the True Link Prepaid Visa® Card for a better way to support clients’ independence and protect their budgets. Provide clients with a restricted, reloadable card that you fund and manage from your desk. Reduce administrative work by replacing cash, checks, and gift cards with a single card. Support greater independence and help to protect benefits eligibility. You work tirelessly to support the well-being and financial security of your clients. It’s not always easy to protect them and their assets from fraud and exploitation. Additionally, disbursing funds and managing money can be time-consuming and complex – especially when each client’s situation is unique. Save yourself time and provide your clients with the best service possible with the help of True Link. True Link’s user-friendly online system allows you to transfer, disburse, and monitor funds for each client, all in one place. 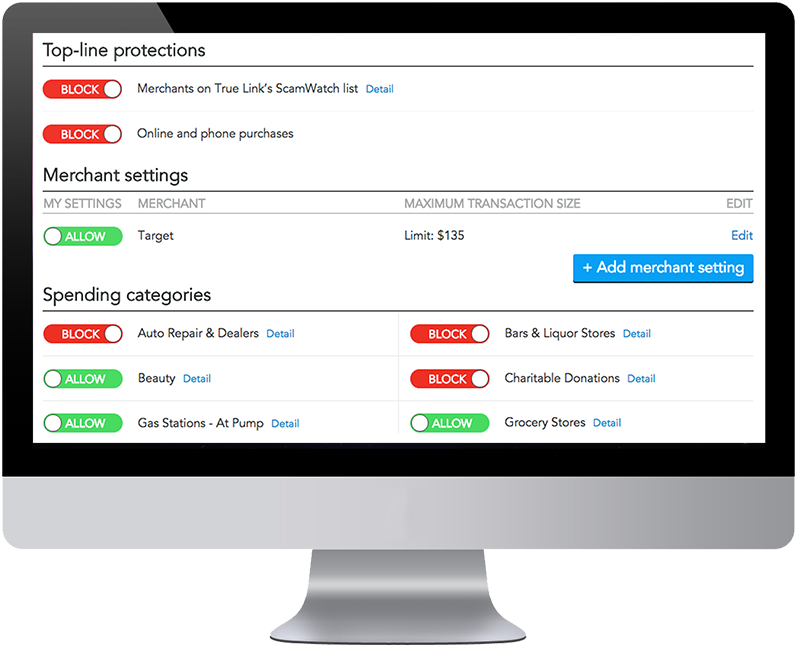 Choose to block specific merchants, limit ATM withdrawals, or prevent over-the-phone and online spending – all while allowing your clients to safely purchase what they need. It’s easy to customize where the True Link Card works to meet the specific needs of each client. Worried about someone losing money to scams or predatory telemarketers? Customize the True Link Card to prevent over-the-phone spending, disable wire transfers, block specific merchants, or limit ATM withdrawals – all while allowing the cardholder to purchase what they need, when they need it. With this administrator-managed card, approve expenses like groceries, medications, and social activities while restricting unapproved or dangerous expenditures. Or – for clients receiving SSI benefits – you can set up the card to block food purchases in order to protect eligibility. Reduce or eliminate time spent managing checks and cash, buying gift cards, or making in-person purchases. 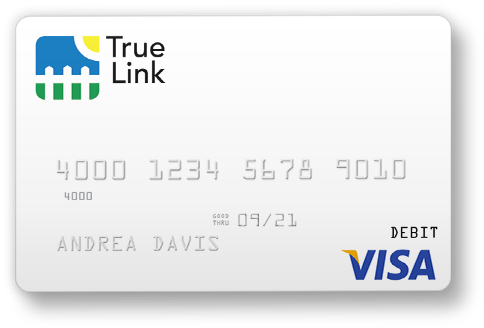 With True Link, you can consolidate spending onto one card. Provide clients or their caregivers with a reloadable prepaid Visa card that is funded online right from your desk. 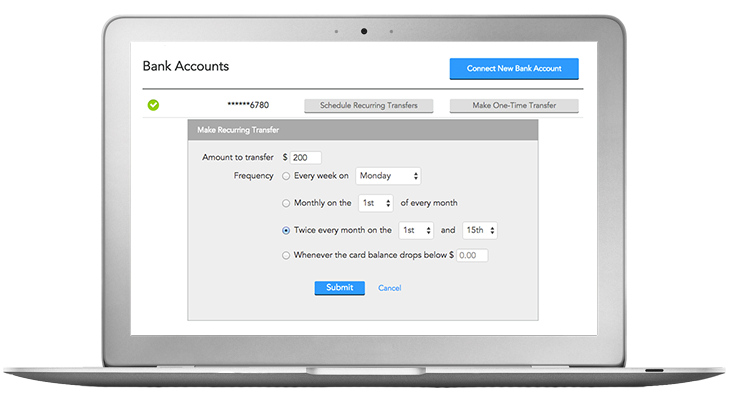 Add money onto the card by transferring funds from a linked checking account or other bank account. Schedule recurring transfers or make a one-time transfer. You save time and avoid hassles while your clients enjoy quicker and more reliable access to funds – and the sense of independence that comes from being able to make purchases for themselves. 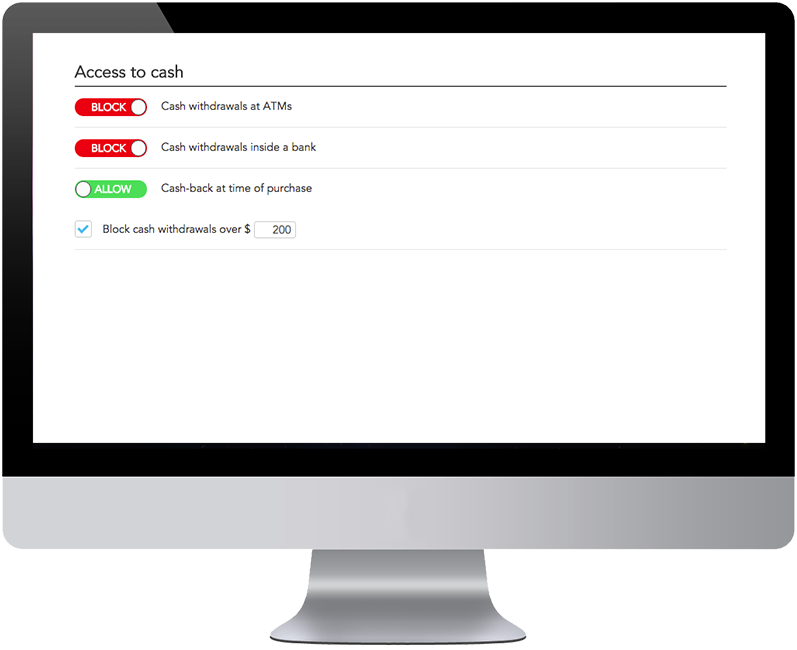 You can set up the True Link Card to prevent or limit cash withdrawals so your clients are only able to spend funds that you approve. There is no way for clients to transfer money onto the card or gain access to any additional funds. Because it is a Visa card printed with the client’s name, the card cannot be transferred or sold. This all takes just a few minutes – and you can do it all online. Have a question? We're here to help. Contact us at 1-866-984-8576. You get this peace of mind for a $10 monthly fee. Click here for a detailed description of all fees.